Hi, I’m Danny Pearson and welcome to my next lesson in a series for the Mike Dolbear affiliated drum school. One of the most common questions I get asked is ‘how do I come up with better fill-ins?’ or ‘more fill-in ideas’. So in this series I will be showing you the sort of fills that I show my students and that I use myself. This month I”m going to show you a nice linear fill-in using 1/16th notes. 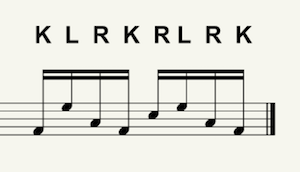 The first group of four 1/16th notes will be this- KLRK (with the left on the hi-tom & the right on the floor tom). And the second group of four will be RLRK (with the first right on the snare, left on the hi-tom & last right on the floor tom). Ok, if you watch the attached video you will see I”ve played the fill-in slowly on its own & then up to speed with a groove.